The EasyFlush™ macerator is a fully automatic pumping system specifically designed for pumping waste from a complete bathroom where gravity drainage is not possible or economical to install. The system is suitable for installing either at the initial building stage or for retrofitting to existing buildings and can accept waste connections from a WC, basin, shower or bidet. The EasyFlush is easy to install and maintain, due to its ‘slip over’ collar discharge hose and easy access lid and can discharge to the left or right. The unit is designed for a direct toilet connection and so should be positioned behind the WC pan on a firm level surface, resistant to condensation. 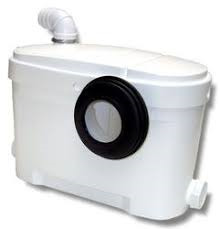 It is extremely important to site the EasyFlush with permanent access in mind for routine maintenance being required. For more information, please call 01773 767611.